The main role of InPrivate Filtering is to prevent third parties from collecting information about the sites you visit. Third parties provide either content (e.g. videos, images, maps) or extended functionality (e.g. Google Analytics) for other websites. For example, if a video from Youtube is embedded on a website, that website will use third party content that will send information back to Youtube about how many views that video had. Also, if a site owner uses Google Analytics for traffic statistics, the Analytics code from his website that is sending information back to Google Analytics is going to be identified by InPrivate Filtering as third-party content. InPrivate Filtering is capable of intercepting third-party content by analyzing each website you visit. If a specific code is found on more than 10 different websites, InPrivate Filtering classifies that code as third-party content. By default, each time you start Internet Explorer 8, InPrivate Filtering is turned off. If you turn it on, you can use it manually, by choosing yourself what third-party content to block, or you can use the auto mode, that automatically blocks third-party content. NOTE: If you choose to block third-party content, it can happen that portions of certain websites you visit will not be displayed correctly. First, download the archive file attached at end of this article. Right click on it and select Extract All. 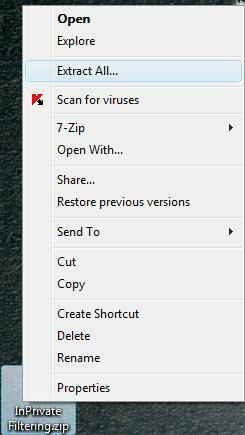 Choose the destination folder and click on Extract. When you open the folder where the archive was extracted, you will see three files: InPrivate Filtering Auto, InPrivate Filtering Manual and InPrivate Filtering Off. 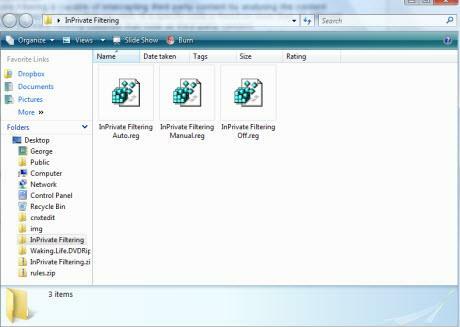 To turn on InPrivate Filtering Auto each time Internet Explorer 8 starts, use the "InPrivate Filtering Auto.reg" file. If you want to turn on the Manual InPrivate Filtering which allows you to select which content to block, use the "InPrivate Filtering Manual.reg" file. If you want to completely turn off InPrivate Filtering, use the "InPrivate Filtering Off.reg" file. Depending on what you want to do, double click on the appropriate file. You will receive an UAC (User Account Control) Prompt. Click on Continue. When you see the window shown below, called Registry Editor, click on Yes. Now you will receive a confirmation message. Click on OK. In order for the changes to be applied, you need to run these files when Internet Explorer 8 is closed. Otherwise you might need to log out from Windows Vista and log back in. NOTE: These files are offered "as is" with no warranties. Thanks. I was looking for this feature, and now from your article, I find that Microsoft has intentionally not allowed this to be on at all times. Then why does MS make it look like it CAN be on at all times? Dumb of them. It is not a good idea to do that. If user want to clean data then may put date to keep history to 0 and also clear all saving requests. Any why is it not a good idea? Firefox allows deleting cookies at the end of every session, and that works great. This is not the same as setting history to 0 and not saving requests; you either have no clue what data is kept by your browser or you're misleading people about what is being kept by their browser. Which is it, buddy? Most people don't realise that tracks of their web browsing are kept forever or are available across multiple sites. At the small expense of, well, remembering your own logins and passwords (which the browser can help you with anyway), you lose nothing by deleting cookies all the time. The only losers are people trying to analyze you, and they still have effective & legitimate ways to do so. Thank you. I highly recommend that to every user! I've had this turned on for a while, but I wasn't sure how to keep it turned on in manual mode. If you keep it turned on in auto mode, eventually it starts blocking useful things, like Facebook profile icons. "To turn on InPrivate Filtering Auto each time Internet Explorer 8 starts, use the "InPrivate Filtering Auto.reg" file. When you see the window shown below, called Registry Editor, click on Yes." Then my registry editor quits working. Why? Email computech.wiz@verizon.net if you know why. How do I keep it on forever while choosing which sites to allow? If I use the "Manual" one do I have to download the "Auto" one too? or how does it work? InPrivate Filtering is unrelated to history or cookies. It is fighting a more sneaky way for web sites use to track users across multiple web sites. The magic of InPrivate Filtering is once it has identififed a beacon, it prevents the browser from ever again requesting that item from the tracking server. You become invisible to that tracking server. The bigger annoyance is they made this an "all or none" deal. You can't hold Control A and click on Block and selectively unblock. The default with selective blocking is to allow. Which registry entries did you add? I want to make this thing manually. Is there any way to add additional ad filters? On some sites some ads are not blocked.